1861– The bloodiest four years in American history began when Confederate shore batteries under General P.G.T. Beauregard opened fire on Union-held Fort Sumter in South Carolina’s Charleston Bay. During the next 34 hours, 50 Confederate guns and mortars launched more than 4,000 rounds at the poorly supplied fort. 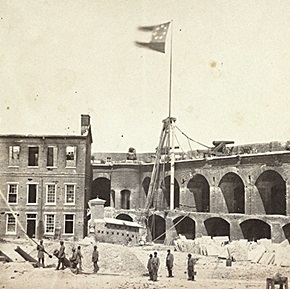 The next day, U.S. Major Robert Anderson surrendered the fort (the photo above shows the Confederate flag being raised). 1864– Major General Nathan Bedford Forrest’s Confederate raiders attacked the Union garrison at Fort Pillow, Tennessee. The fort, an important part of the Confederate river defense system, had been captured by federal forces in 1862. Of the 500-strong Union garrison defending the fort, more than half the soldiers were African-Americans. After an initial bombardment, General Forrest asked for the garrison’s surrender. The Union commander refused, and Forrest’s 1,500 cavalry troopers easily stormed and captured the fort, suffering only moderate casualties. However, the extremely high proportion of Union casualties – 231 killed (2/3 of them black) and more than 100 seriously wounded – raised questions about the Confederates’ conduct after the battle. Union survivors’ accounts, later supported by a federal investigation, concluded that African-American troops were massacred by Forrest’s men after surrendering. 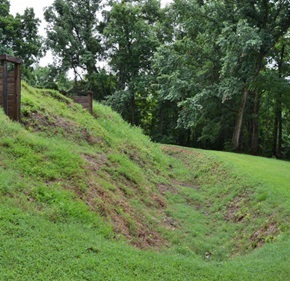 Union fatalities were buried in a mass grave (shown above) at the end of the fort. The bodies were laid in the moat and dirt was shoveled down from the parapet. In the spring of 1866 the bodies were exhumed and re-interred in the memorial cemetery south of the fort. The Confederates evacuated Fort Pillow that evening so they gained little from the attack except to temporarily disrupt Union operations. The Fort Pillow Massacre became a Union rallying cry and cemented resolve to see the war through to its conclusion. 1877– James Tyng, the catcher for Harvard University’s baseball team, wore a modified fencing mask behind the plate. 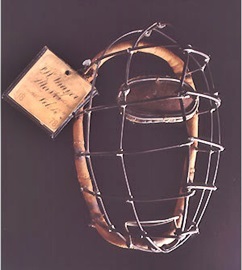 It was the first time a catcher’s mask was used during a game. Harvard manager Frederick Thayer designed a mask that added a forehead pad and chin rest to help absorb the impact of the ball. He also replaced the fine wire mesh of the fencing mask with a “birdcage” face protector that improved visibility. The mask (shown in the photo above) is on display at the Baseball Hall of Fame. 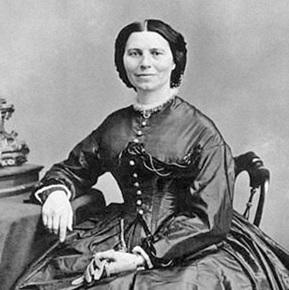 1912– Clara Barton, a nurse and founder of the American Red Cross, died at the age of 90. She was a teacher and a government worker before heading off to minister the wounds of soldiers, often on bloody civil war battlefields. Barton was so close to the front lines at the Battle of Sharpsburg that a bullet passed through her clothes and killed the wounded soldier she was tending. After the war, she ran the Office of Missing Soldiers and helped locate more than twenty-two thousand missing men. During a visit to Europe, she was told of an organization called the International Red Cross Committee. She came back to the United States and began work toward organization of an American Red Cross. Barton became the first president of the organization and served as its head for twenty-two years. 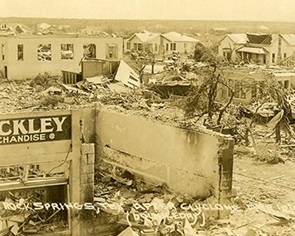 1927– Rocksprings, Texas was hit by an F5 tornado that destroyed 235 of the 247 buildings in the town. The tornado killed 72 townspeople and injured another 205. 1934– The wind was howling in New Hampshire. Wendell Stephenson, a staff member at the Mount Washington Observatory, checked the wind speed recorder. It registered at 105 mph. It was clearly less than he expected. 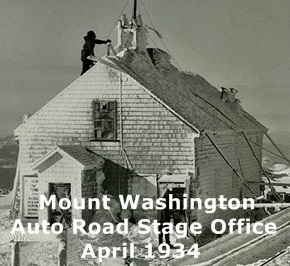 This meant one thing – the instrument on top of the Auto Road Stage Office (the Observatory’s early home) was hampered by ice buildup. At 4:00 a.m., Stephenson suited up, grabbed a wooden club and headed for the door. The intense wind created so much pressure that he was knocked to the floor as he opened the door. He struggled as he made his way to the ladder. With dozens of blows, he cleared the accumulated ice from the anemometer. He dropped the club by accident, and it sailed off into the fog. Back inside, he flipped on the recorder and verified that the wind now topped 150 mph. As the day wore on, Stephenson and fellow staffers Salvatore Pagliuca and Alex McKenzie checked the readings as winds grew stronger and stronger. Frequent values of 220 mph were recorded with occasional gusts of 229 mph. And then, at 1:21 p.m., the extreme value of 231 mph out of the southeast was recorded. It was the highest wind gust ever recorded on the surface of the Earth. The Mount Washington record was toppled in 1996 when an unmanned instrument station in Barrow Island, Australia recorded a new record of 253 miles per hour during Typhoon Olivia. Though the Observatory record fell, it still stands as the highest surface wind speed ever observed by man. 1945– U.S. President Franklin Delano Roosevelt, the longest serving president in American history, died three months into his fourth term. Roosevelt was at his “Little White House” retreat in Warm Springs, GA to rest before his anticipated appearance at the founding conference of the United Nations. 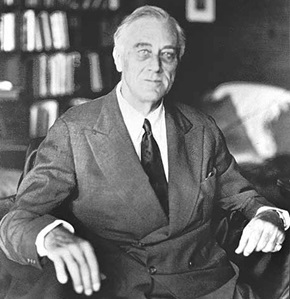 On the afternoon of April 12, Roosevelt said, “I have a terrific headache,” then slumped forward in his chair, unconscious, and was carried into his bedroom. The president’s attending cardiologist, Dr. Howard Bruenn, diagnosed the medical emergency as a massive cerebral hemorrhage. At 3:35 p.m, Roosevelt died at the age of 63. The photo above was taken one day before Roosevelt’s death. It was the final photograph taken during his life. 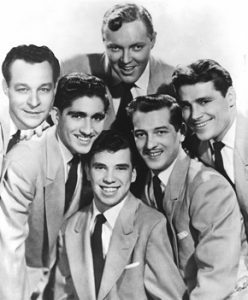 1954– Bill Haley and the Comets recorded (We’re Gonna) Rock Around The Clock at Pythian Temple studios in New York City. The single sold a respectable but underwhelming 75,000 copies in the coming months, and was destined to be forgotten until it was chosen to play over the opening credits of the 1955 film, Blackboard Jungle. On July 9, 1955, Rock Around The Clock became the first rock and roll recording to hit the top of Billboard’s Pop charts, a feat it repeated on charts around the world. If rock and roll was a social and cultural revolution, then (We’re Gonna) Rock Around The Clock was its Declaration of Independence. 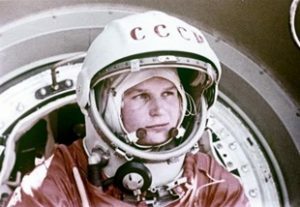 1961– Onboard the spacecraft Vostok 1, Soviet cosmonaut Yuri Gagarin became the first human being to travel into space. During the flight, the 27-year-old test pilot and industrial technician also became the first man to orbit the planet, a feat accomplished by his space capsule in 89 minutes. Vostok 1 orbited Earth at a maximum altitude of 187 miles and was guided entirely by an automatic control system. The triumph of the Soviet space program in putting the first man into space was a great blow to the United States, which had scheduled its first space flight for May 1961. In addition, Gagarin orbited Earth, a feat that eluded the U.S. space program until February 1962 when astronaut John Glenn made three orbits in Friendship 7. 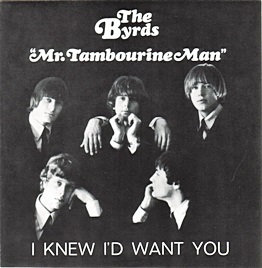 1965– Mr. Tambourine Man / I Knew I’d Want You was released by Columbia Records as the debut single of the Byrds. The single’s success – it shot to #1 within weeks – initiated the folk rock boom of 1965 and 1966, with many acts imitating the band’s hybrid of rock beat, jangly guitar, and poetic or socially conscious lyrics. When the two songs were recorded in January 1965, producer Terry Melcher’s initial lack of confidence in the Byrds’ musicianship resulted in Roger McGuinn being the only Byrd to play an instrument on both sides of the single. Rather than using band members, Melcher hired musicians from the Wrecking Crew: Jerry Cole (rhythm guitar), Larry Knetchel (bass guitar), Leon Russell (electric piano), and Hal Blaine (drums), who – with McGuinn on lead guitar – provided the backing tracks. 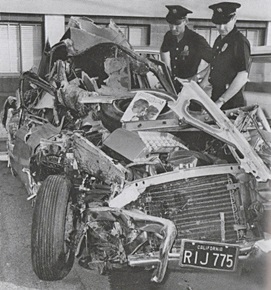 1966– Singer Jan Berry (Jan & Dean) received severe head injuries in an automobile accident on Whittier Drive, just a short distance from Dead Man’s Curve in Beverly Hills. He was on his way to a business meeting when he crashed his Corvette Stingray into a parked truck. Berry was in a coma for more than two months and suffered brain damage and partial paralysis. Dead Man’s Curve Factoid: Two years earlier, the duo’s song Dead Man’s Curve had reached #8 on the Billboard Hot 100. In that song, the driver involved in the accident was driving a Corvette Stingray. 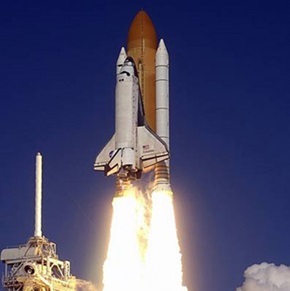 1981– The space shuttle Columbia was launched from Cape Canaveral, Florida, becoming the first reusable manned spacecraft to travel into space. Piloted by astronauts Robert L. Crippen and John W. Young, the Columbia undertook a 54-hour space flight of 36 orbits before successfully touching down at California’s Edwards Air Force Base. 1981– Former heavyweight boxing champion Joe Louis died of cardiac arrest at the age of 66. The “Brown Bomber” had a career record of 66-3 with 52 knockouts. 1989– Former welterweight and middleweight boxing champion “Sugar Ray” Robinson died of complications of diabetes and Alzheimer’s disease. He was 67. Robinson’s career record was 171-19-6, with 108 knockouts. In addition to being two of the greatest boxers in history, these men shared something else. 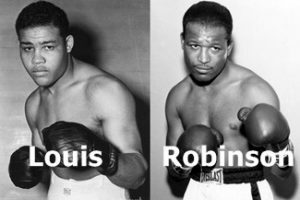 Despite earning millions in the ring, they both struggled financially, thanks to numerous con artists and the overall corruption of the boxing business that existed in their lifetimes. 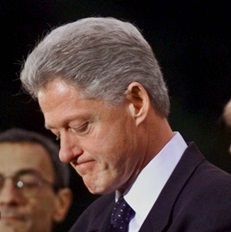 1999– U.S. District Judge Susan Webber Wright found President Bill Clinton in contempt of court for giving “intentionally false” testimony in a lawsuit filed by Paula Jones about his relationship with former White House intern Monica Lewinsky. I find the last one ironic. Thanks again! Donna … it was certainly that.